This report uses NHATS to describe the relationship between dementia status and late-life disability and care needs of older adults. We group older adults as probable, possible or no dementia based on a dementia classification developed earlier (Kasper et al. 2013). As a progressive disabling condition that increases in prevalence with age, dementia is a concern for its effects on functioning and quality of life of older people as well as on family and friends who become sources of support as capabilities to live independently decline. Our results underscore the substantial role of dementia in late-life disability and in caregiving to older people. Most persons with probable dementia not in nursing homes received assistance from others with self-care, mobility, or with household activities for health or functioning reasons (78%). The proportion receiving help is far higher than for persons with possible dementia (42%) or those with no dementia (18%). The concentration of assistance among persons with dementia means that those with probable dementia account for close to one in three (28%) of the 9.9 million people not in nursing homes who received help with these activities (persons with probable or possible dementia account for 45%). The impact is even more striking for those at more intense levels of assistance--persons with probable dementia account for nearly half of the 2.7 million older adults receiving help with three or more self-care or mobility activities. Three-quarters of persons with probable dementia also receive assistance with household activities. These activities require higher level cognitive functioning, and these results are consistent with numerous studies that have found a relationship between diminished cognition and difficulty or need for assistance with activities such as meal preparation, shopping, and banking (Farias et al. 2009; Peres et al. 2006; Purser et al. 2005). Although dementia is highly prevalent among nursing home residents--estimates range from 50% to 75%--little information has been available concerning residence in other supportive living environments by dementia status. Our findings show that living in non-nursing home supportive care settings is more common among those with probable dementia--about one in five did so among those not in nursing homes. While the majority of persons with dementia were cared for in community settings, these results suggest the importance of recognizing supportive care settings other than nursing homes as environments where many residents have dementia-related disability and care needs. Prevalence of dementia varies by characteristics such as income (higher in the lowest income quartile), race/ethnicity (lower among White individuals although Whites account for over two-thirds of all non-nursing home persons with probable or possible dementia), and marital status (higher among widowed persons who together with married persons account for three-quarters of persons with probable or possible dementia). Perhaps most striking, although not surprising, is the high proportion of low income persons among those who received assistance with any activity, but even here 46% of those with probable dementia are in the lowest income quartile, compared with 33% of persons with no dementia. While it is generally accepted that dementia caregiving is particularly burdensome (Shultz & Martire 2004), our findings reveal differences in caregiving networks and levels of support at the national level by dementia status. About three-quarters of persons receiving the highest levels of assistance had more than one caregiver regardless of dementia status (73%-77%), but persons with probable dementia more often had more than one caregiver at other levels of assistance. Almost all (95%) persons receiving assistance had unpaid help. One-third of informal caregivers are assisting someone with probable dementia and two-fifths of all hours were to persons with dementia. In addition, one-third of caregivers to persons with probable dementia were daughters. While only 15% of caregivers to persons with probable dementia were spouse caregivers, they provided on average 145 hours of help. High percentages of caregivers reported positive aspects of caregiving regardless of whether the recipient had dementia. Caregivers to persons with probable dementia experienced more negative effects from caregiving, however--18% indicated a substantial negative impact and another 31% indicated some negative impact compared to 6% and 25% respectively for caregivers to someone without dementia. Persons with probable dementia were more likely to have paid help in addition to unpaid help for self-care or mobility assistance in particular. Total hours of assistance with any activity in the last month to persons with probable dementia was more than double that for persons who received assistance but had no dementia. Hours of both paid and unpaid assistance were substantially higher for persons with probable dementia compared to others, but despite the additional paid help, the proportion of all hours from unpaid helpers was similar for persons with probable (83%) and no dementia (85%). Caregivers to persons with probable dementia were more likely than other caregivers to use some caregiver support services (respite, training, financial help) but also were more likely to be looking for support services. In general, use of formal support services was low among all caregivers. There are several limitations to this analysis. Our dementia classification cannot be equated with a clinical diagnosis. Nonetheless, our estimates of dementia are in line with others from large population-based studies and our classification measure showed good sensitivity and specificity in a diagnosed sample (Kasper et al. 2013). We were unable to include nursing home residents in this analysis since these individuals were not interviewed in the first round of NHATS and, as a result, we cannot assign dementia status. Nursing home residents are a small percentage of the 65+ population (2.9%; Freedman & Spillman 2013), but from 50% to 75% of older persons living in nursing homes are thought to have dementia. Excluding these individuals likely understates by a small amount the role of dementia in receipt of help with self-care and other activities of daily life. Because NHATS included older adults in all other supportive care settings, however, this important and growing group is included in our analyses of disability and caregiving. Our findings suggest many differences in late-life disability and caregiving by dementia status. While dementia is likely a major contributor, other comorbid conditions may also be important in explaining differences between those with persons with and without dementia. Finally, these analyses are cross-sectional and further research is needed to clarify how disability and caregiving change with dementia status transitions. In conclusion, this report provides a national picture of the role of dementia in late-life disability and care for older adults. Disability in a range of activities that are part and parcel of independent living among persons with dementia in turn translates to substantial caregiving support that is being provided by family and friends, as illustrated by the findings on hours of assistance provided by unpaid helpers to those with probable dementia. The National Alzheimer's Project Act of 2012 represents a new national plan to address the challenges of dementia on many fronts. 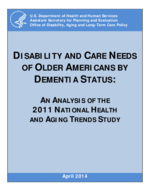 The data in this report provide new and important information documenting the impact of this disease on older people and their families and the basis for further investigation into how policies and programs can meet the needs of the millions of Americans affected by dementia.